This month’s plant profile strays away from the usual herbaceous perennials featured here, but the plant looks so tremendous at this time of year, it is very deserving of a place in the perennial garden as a “backbone” plant. 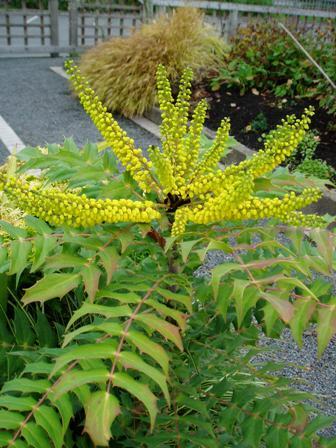 Its size, color, texture, and form make it an ideal backdrop for spring, summer and fall perennials plants, but as everything lays low for winter, this shrub takes center stage. 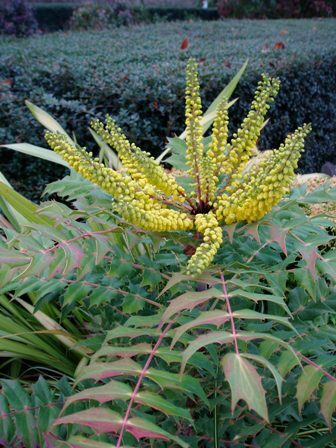 A most appropriate variety names for this time of year, ‘Charity’ is the most common and readily available of the so called “Mahonia x media” cultivars. It flowers as early as November (with some gardeners getting a few blooms starting in late October). Birds and bees flock to the golden yellow flowers that are gently scented and full of nectar. These incredible flowers open throughout the winter providing the sunshine of color we so desperately need at this time of year. The rugged foliage is also very textural and takes on red and purple hues as temperatures drop. This plant currently resides in an evergreen container in the Soest Garden planted with Chamaecyparis ‘Fernspray Gold’, Phormium ‘Yellow Wave’, Carex ‘Evergold’ and Leucothoe axillaris . Sun: Full shade to part sun. Water: Medium moisture and average soil. Fairly drought tolerant once established.